Join internationally acclaimed impermanent earth artist and teacher for a not-to-be-missed workshop on working with plants as a sacred art - featuring a hands-on and interactive plant altar build. We will meet at The Alchemist's Kitchen and then venture out into our Concrete Jungle for this workshop adventure. Learn and explore the 7-step process to create Morning Altars - impermanent earth art based on a daily practice and beauty making ritual. This hands-on experience is a deeply moving and informative opportunity to understand the ancient and cross-cultural use of plant altars to honor milestones, process grief, connect with the land/ancestry, and to simply bring more beauty to our lives. Schildkret will speak about how earth altars have enlivened his life and inspired tens of thousands of people from across the globe to build earth art every day. During the workshop, participants will embark on a journey to build their own piece through the 7-step building process. 1. Wander and Wonder: We go on a journey! We will head outside with a basket, pair of scissors and a willingness to see nature as you've never seen it before. This is a treasure hunt that exercises awe and curiosity. 2. Find Your Place: Time to slow down. Listen to the place that calls you. Sit with the earth and practice a “Place Meditation” to connect more deeply to where you are. 3. Clear: Add more space. Use a brush or your hand to clear the space and reveal your blank canvas. This exercise addresses the clutter and overwhelm in our lives and helps you clear physical and mental space to allow the new creative energies to flow in again. 4. Create: Let it flow. Start by beginning in the center of your canvas and building outwards. Face the doubt that says “I’m not enough” and learn to trust in your own center through the artistic tools of proximity, symmetry, and consistency. 5. Bless: Make meaning with it. Learn to set an intention for the MorningAltar and devote it as an offering to yourself, your family’s well-being, to your ancestors, or to the Earth. 6. Walk Away: It’s impermanent. Practice walking away and letting go as an exercise to strengthen your ability to accept change gracefully. 7. Share: Be seen. Photograph and share your beauty-making and intentions with your community. Let others receive your work and inspire them to create their own earth art. 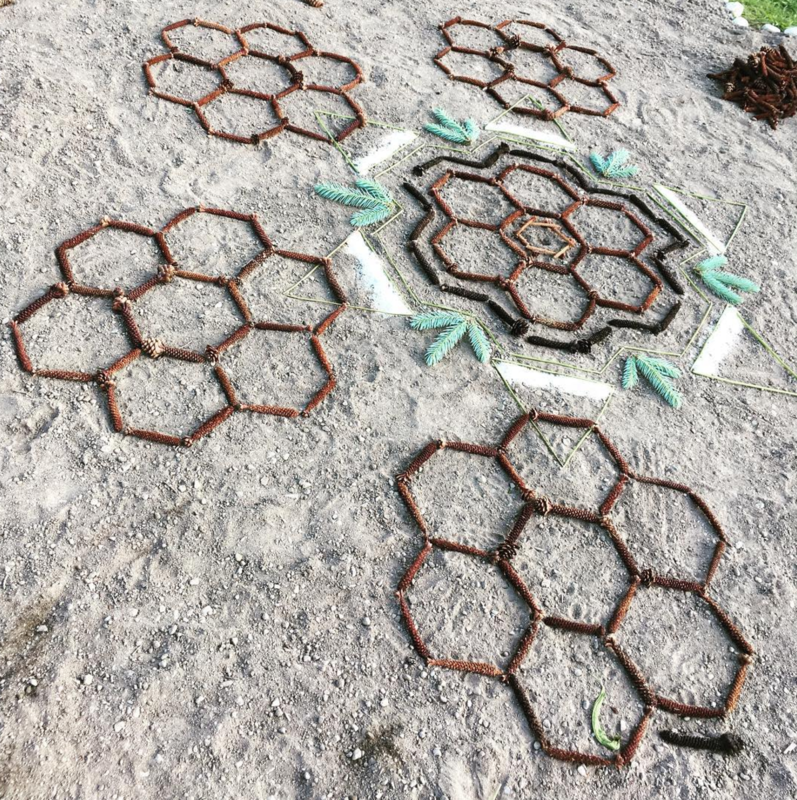 Day Schildkret is known internationally for Morning Altars and has inspired thousands of people of all ages from all over the world to forage, build and be awed with Earth Art. Day is igniting an international movement by sharing the art, teachings and spirit of Morning Altars as a tangible spiritual practice that renews and redeems our relationship to wonder, creativity, nature connection, generosity, and impermanence. The first Morning Altars book is due in bookstores and online Fall 2018.